Construction is now underway of the distinctive 45 storey residential tower in the London Docklands, named the Baltimore Tower. 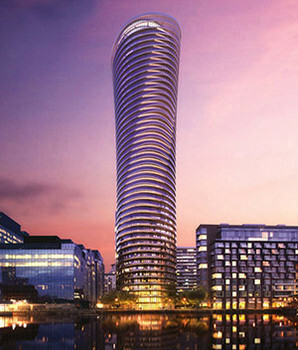 The design of the tower is unique; with the twisting glass balconies it creates a visually stunning building, providing high end living accommodation. The iconic new landmark for luxury living at Canary Wharf is due for completion in summer 2016. Armorgard have been working with some of our distributors in supplying the contractors on the Baltimore Tower. Perhaps you have some customers that are working on this site? Have you asked them if they need anything to lock away their tools whilst working on the site? It could provide you a good opportunity to resell some Armorgard equipment! We’ve have just spent an entire week taking new photographs of all our products. We wanted to refresh our image bank, so that all product images are show the new branding, so we set to and. We’re in business to make life easier for those on the tools, and we do this by creating products and relationships that are built to last. We want our products to endure, and work hard.